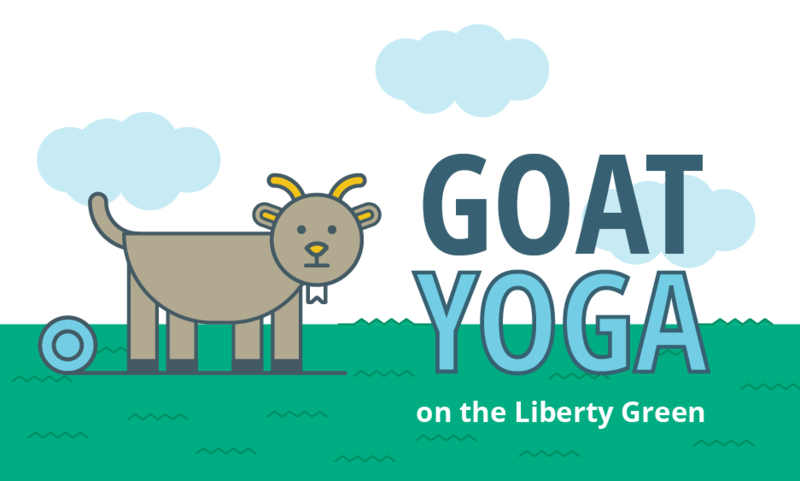 Goat Yoga is returning to the Liberty Green. We will be hosting pop up classes on Sunday, May 5 and Saturday, June 29. Attendees can look forward to an hour of yoga practice followed by playtime with the baby goats. WHERE: The Liberty Green – the former baseball field on the Liberty campus. Use 9380 Quadrangle Street or “Liberty Green” for your GPS and follow signs for The Liberty Green. REGISTER: Get your tickets here. Children should be no younger than 10, comfortable with animals, and accompanied by an adult to attend. ALL individuals entering the tent MUST have a ticket, regardless of whether or not participating in the yoga class. The class is being instructed by Beth Wolfe with goats visiting from Walnut Creek Farm. For more information on goat yoga and other events at Liberty, follow us on Facebook at The Liberty Life, Instagram @LibertyLorton, and Twitter @LibertyLorton.